May 15, 2014. What an exciting and fun week it has been! Although it started raining heavily from the very moment the shores of Stone Town were in sight and it has not stopped since (I guess that is why they call it the rainy season), it did not discourage the 55 coaches and teachers to show up on Monday, ready to participate in their second annual training with Coaches Across Continents. 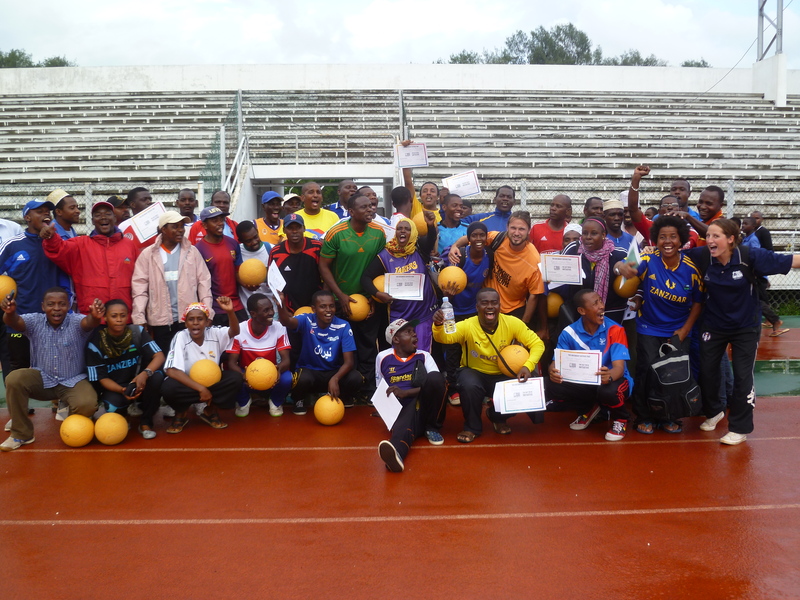 The program in Unguja and Pemba, Zanzibar’s two largest islands, stems from an interesting and dynamic partnership between the Zanzibar Football Association, the Zanzibar Coaches Association, the Zanzibar National Sports Council, the Ministry of Education, and Save The Children. All partners were represented at the opening ceremony where the importance of protecting children from abuses was emphasized (violence against children is still the norm). This was perfect since CAC has recently finalized a brand new child rights curriculum and has started to incorporate child protection training as a core part of every CAC program. We had the chance to run the training at Amaan stadium, playing games in the mornings on the beautiful turf field with some of Zanzibar’s 20,000 One World Futbols and reviewing games in the classroom in the afternoons. After a quick refresher course of Messi games and Mingle Mingle we gave participants the opportunity to decide what they would be learning during the training, selecting to focus on nutrition, drug abuse, including children with disabilities, and the importance of education and child rights which then became our focus for the week. What a great stadium for Coaches Across Continents to work! Although all days were comparable to one another in terms of the liveliness, engaging discussions and participants’ good-natured spirit, Wednesday was my favorite day of the week: it was entirely dedicated to child rights and child protection. The morning session games teaching about different child rights preceded an engaging hour and a half long discussion in the afternoon about how we could work together to protect children from suffering abuses on the sports field. The games played in the morning certainly helped fuel the discussion and one teacher even remarked that playing those games with the children could be a solution to protecting their rights. The child rights game that is quickly becoming one of my personal favorites is ‘Know Your Rights’. 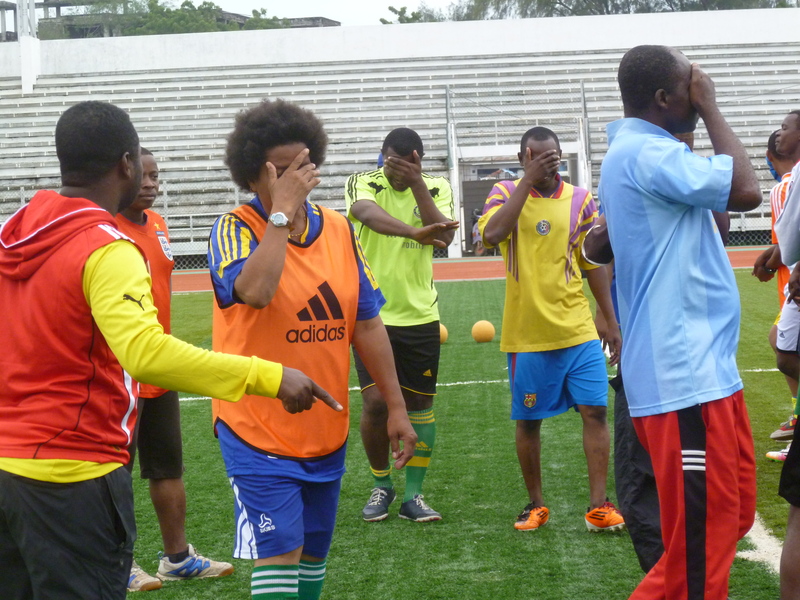 Players from opposing teams in the center circle have to run to cones representing different child rights. The coach yells out two rights and players from the first team run to the first cone, the others to the second one. The game requires speed but also quick thinking and reaction. For some reason, this game seems to trigger the competitive spirit of even the most reserved players. After a couple of rounds, there was shouting, yelling, encouraging and cheering from all sides. It is hard to describe the exuberance and feeling of pure joy that emanated from the game, but I can easily say that this was one of the most euphoric and energy-filled 30 minutes that I have experienced with Coaches Across Continents. I think that everyone would have been happy to continue on for three more hours. It was a close contest between Belgium and Germany but I have to admit that Germany might have come in victorious. The training came to an end on Friday afternoon, after participants coached games they had invented about nutrition, what makes a healthy life, making good choices, including blind people, and safe spaces in the community. TV, radio and newspaper journalists were present to show the Zanzibar community what wonderful work these local educators are aspiring to. We leave for Pemba, our heads filled with countless memories of laughter and joy, and energized by the motivation and passion of these inspiring coaches; but also convinced that this next week of the partnership will be just as rewarding! 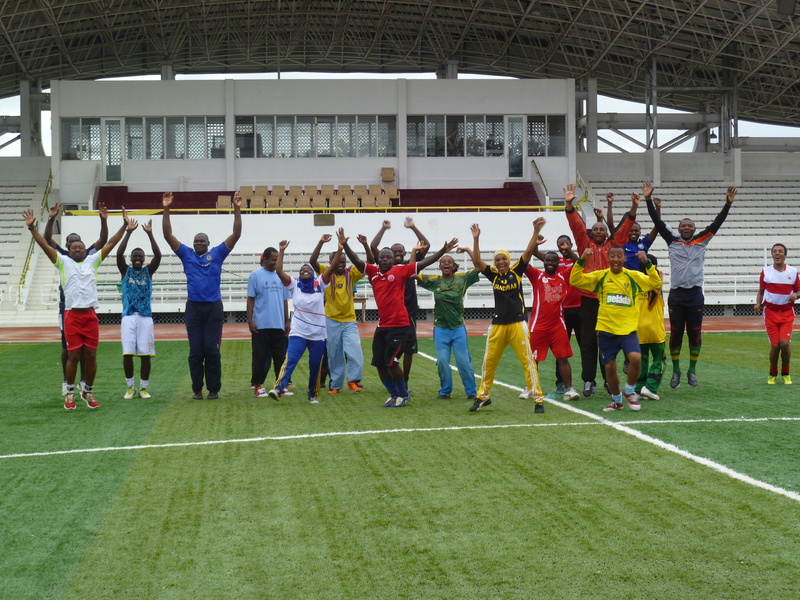 Unguja (Zanzibar) coaches celebrating after a great week working with Coaches Across Continents!